The WING UV Blue case cooling fans are premium quality, UV reactive, ultra- quiet, dust and waterproof for gaming enthusiasts. The WING UV series features an unique bearing with patented design, winglet fans blades and low starting voltage. 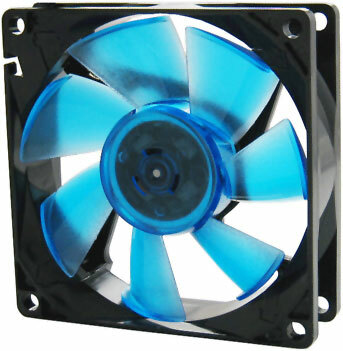 Only the highest quality materials have been used to manufacture this state-of-the-art cooling fan. To add to the silence fan mounts replace traditional screws and are made of high quality, ultra-soft silicone which stop vibrations from the fan motor from travelling into your PC case. Patented Nanoflux bearing incorporates a clever magnetic design, very high precision manufacturing and runs friction-free and operates noiseless. Electromagnetic fields are exploited to keep solid parts from touching. The load is carried by a magnetic field. The Nano-technology composite ensures lowest abrasion and extreme durability (MTTF 100,000 hours). Compared to other Magnetic bearings this technology allows the impeller to be detached and thus the fan blades can be cleaned easily. Even though conventional sleeve and ball bearings currently dominate the fan market both have their disadvantages. While sleeve bearings have very low noise emissions and are very cost effective, they tend to leak oil; once the oil has dissipated the fan can no longer operate. Ball bearings, on the other hand, while providing longer operating life are costlier, noisier and are prone to damage. Gelid's Nanoflux bearing uses magnetic flux to limit contact and friction between the bearing and the shaft. High precision self-lubricated material eliminates oil leakage. The result is a ultra quiet long life bearing. Vibration from fan motors can travel into a PC case and become amplified when a fan is fitted tightly. This vibrational noise is annoying if you wish to build a very quiet or virtually silent PC. These rubber mounts have been designed specifically to deal with fan-induced vibrations and are an ideal alternative to standard fan screws, leaving vibrations 100% decoupled from your PC case.